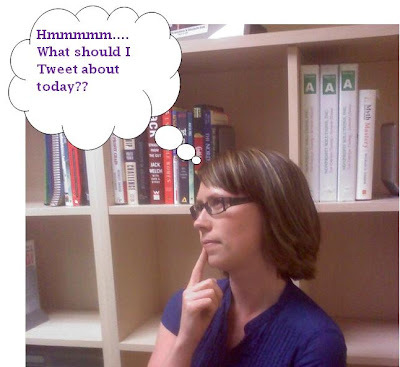 Guest Post: HootSuite for Library Tweets! Librarians, If you have a Twitter account for your library, I highly recommend tweeting from HootSuite.com. If you currently tweet from the original web version of Twitter.com, follow these instructions to simplify tweeting on behalf of your library. Go to HootSuite.com and register. Since I am the sole person that tweets for our library, I tweet for both @csbsjulibraries and @amylibrarian from one HootSuite account. See below. You check which account you would like to tweet from. In the web version of Twitter, you can see if someone is using HootSuite or another Twitter application. If a library uses HootSuite, it appears like this. The biggest benefit of using HootSuite is that you can schedule tweets. I know that we have a Book Lovers event on April 13th. I have already sent a tweet advertising for the event, but I’d also like to send a tweet on the day of the event. Here is how I would do it. Here is what it looks like in HootSuite when you have scheduled tweets. You have a list of tweets that have been sent and a list of tweets that are pending. You can go back and edit any tweets that are pending. Now that I can schedule tweets, I spend a dedicated amount of time scheduling tweets for weeks in advance instead of dabbling in Twitter each day. I realized last week that Holocaust Remembrance Day was coming up on Sunday, April 11th. I do not work on Sundays. This is not a problem, I scheduled the Tweet. Another great feature of HootSuite is that you can easily view conversations of back and forth ‘replies’ with patrons. Just click on Show Conversation. After clicking on show conversation, you will see the back and forth dialogue. In December, the library had extended hours for finals, but the automated lights were still set for our normal library hours. Unfortunately, this left our students in the dark at midnight. I heard about this situation through Twitter! Please let me know if you have any questions about using HootSuite! Great post, Amy! We/I use Hootsuite at Towson for the library’s twitter account. I like that they’ve finally included functionality for seeing who is following us and who we’re following. I’ve also set up a few searches that show not only when someone mentions our twitter account (@cooklibraryoftu) but also when they tweet the words ‘library’ and ‘towson’. It’s always fun to see what the tweeters are saying about the library! David, You make a great point about saving search terms like ‘library’ and ‘your library’s name.’ It’s important to stay *in the know* on what people are tweeting about the library. Right on.